The Los Angeles Rams are heading to the Super Bowl and are now just days away from their battle with Tom Brady and the New England Patriots. Here are the latest updates coming out of the Rams camp. The story of what happened to Rams running back Todd Gurley in the NFC title game remains a mystery. Gurley did play early in the contest, but a missed blocking assignment and a tipped pass leading to an interception resulted in him having a reduced workload for the remainder of the game. 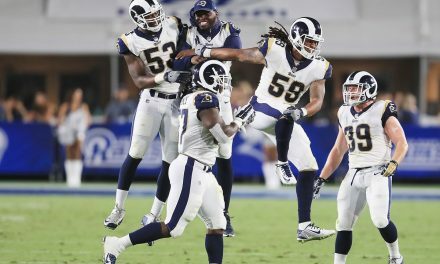 He spent the majority of the final three quarters on the sideline, while CJ Anderson received the early-down carries, although Gurley did get a few more touches. He hasn’t been on the injury report leading up to Super Bowl LIII, and did say he’s not hurt, so it appears to be more of a mental block. Rams head coach Sean McVay spoke about that very subject in speaking to reporters on Tuesday, and he stated that he needed to do a better job in getting Gurley involved in the offense. Rams All-Pro defensive tackle Ndamukong Suh is wrapping up his 10th season in the NFL, and it’s safe to say he’s had a pretty complete career already up to this point. Suh has a history of stuffing the run, getting to opposing quarterbacks and being involved in controversial plays — although he seems to have cleaned that up in recent years. He’s a complete, every-down player, and is a big reason why all teams he’s played on have been stout in the trenches, given what he does in the interior of the line. He was once the highest-paid defensive player in NFL history in 2015, and now he’s actually playing out a one-year deal, although he’ll be playing for a Super Bowl ring on Sunday. Suh opened up about how this season ranks among the others — specifically that it’s the most special. When the Super Bowl line opened up, the Rams were favored at -1. However, heavy betting on the Patriots shifted the line all the way to New England -2.5. Currently about 80% of all bets have been placed on the Patriots, which has set Vegas up to take some heavy losses if Tom Brady and Bill Belichick end up hoisting their 6th Lombardi Trophy. Los Angeles fans have taken it upon themselves to support their new team both with their hearts and their money. A lot of West Coast sports books are starting to see increased bets on the Rams. Vegas insiders are whispering that “smart” money is now starting to trickle in on the Rams as fans take advantage of the new line. Getting 2.5 points in a game that many consider to be a “pick em” is great value, especially if you are using one of your free bets to wager on the game. The Super Bowl is bound to be a close game. Every single one of the Patriots eight previous Super Bowls under Belichick and Brady were one-score games. There’s a high likelihood that the Rams +2.5 will be the winning bet this Sunday. Patriots quarterback Tom Brady may be 41 years of age, but he has his team in the Super Bowl for the fourth time in five seasons, and he hasn’t really shown signs of slowing down as of yet — not to many of us, at least. But Rams cornerback Nickell Robey-Coleman seems to feel differently. He and his teammates have obviously been watching a lot of tape on Brady and the Patriots this past week, in preparation for Super Bowl LIII, and the Rams cornerback shared some candid thoughts in an exclusive interview with Bleacher Report. Brady never really moved all that well in the pocket, and he certainly wasn’t known for his speed, as he ran a 5.28-second 40-yard dash at the Scouting Combine. Still, Robey-Coleman does raise some good points about being hesitant to throw downfield. The Patriots have been dink-and-dunking, for the most part, this season.